I had to re -post one of my most favorite DIY's. This heart Tee Makes me Smile every time I see it. Love to you All on this day to Celebrate LOVE and Life! I hope I am finding all of you well this week. 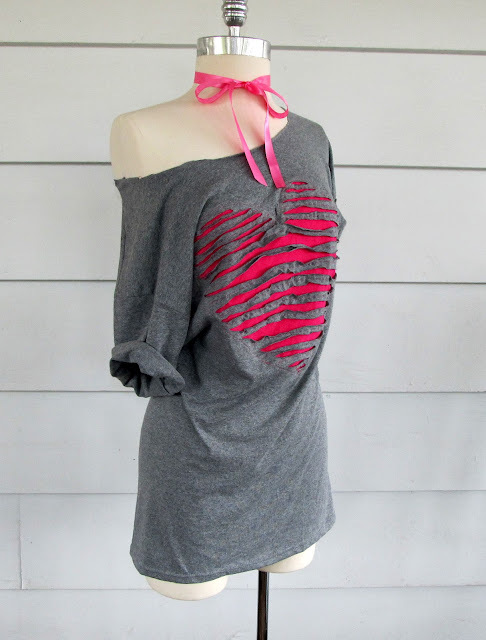 I wanted to do a Heart, off the shoulder Tee-shirt. 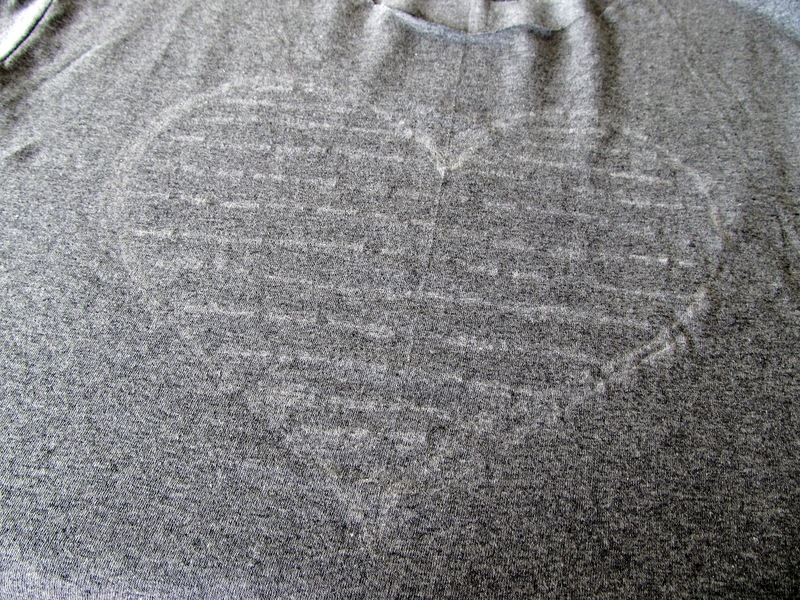 this was not a super easy 5 minute shirt, but it was not the hardest either. 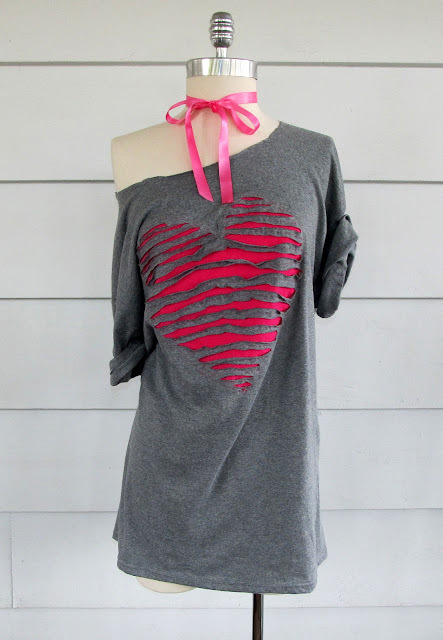 If you have a sewing machine and an hour, you could most definitely make this. 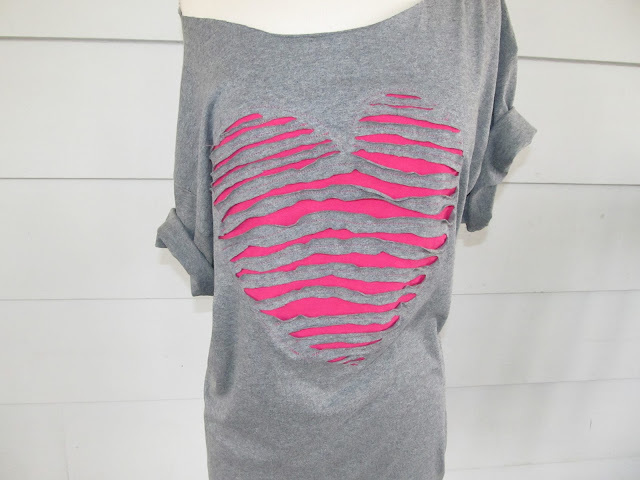 Scrap piece of T-Shirt in a contrasting color, or just a scrap piece of material to cover the heart you make. If you want to keep the collar, then leave it alone. if you don't want to draw it free hand. Inside your heart, draw lines 3/4 of an inch apart. 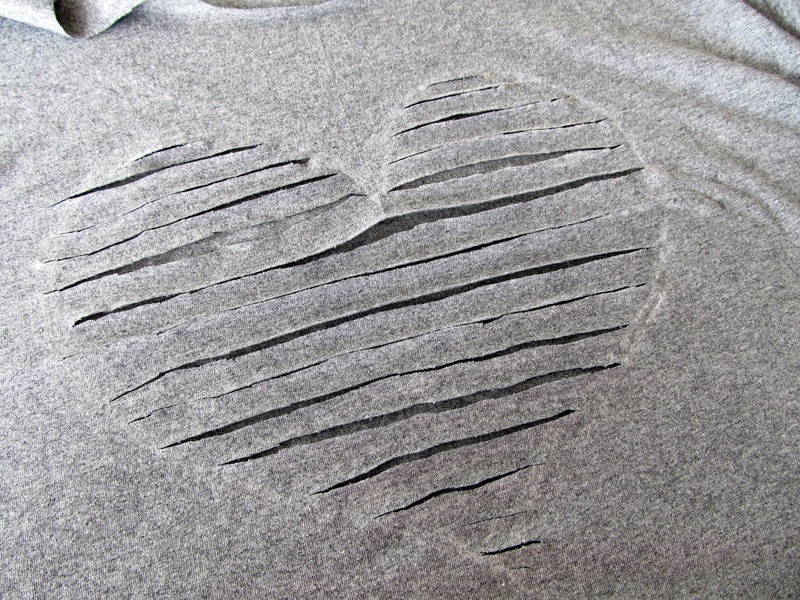 carefully cut the lines inside the heart. 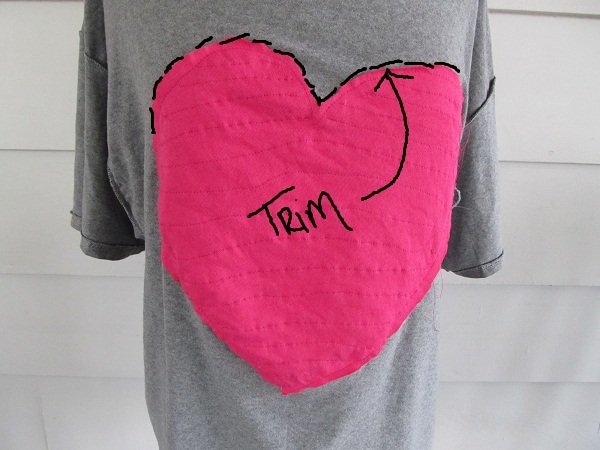 Turn your shirt inside out and place your scrap piece of material over the heart and pin it. 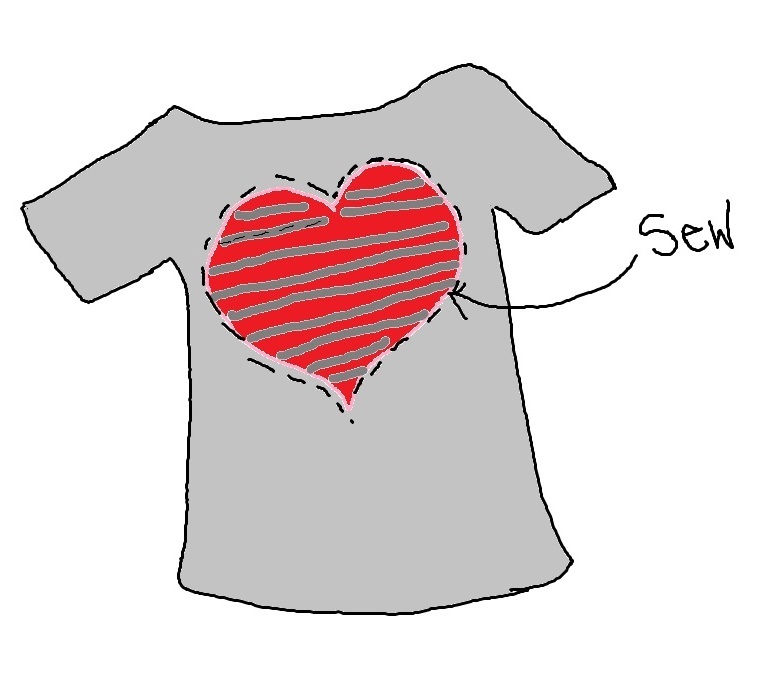 Turn it back right side out and sew around the edge of the heart. this will anchor the heart so it keeps its shape. 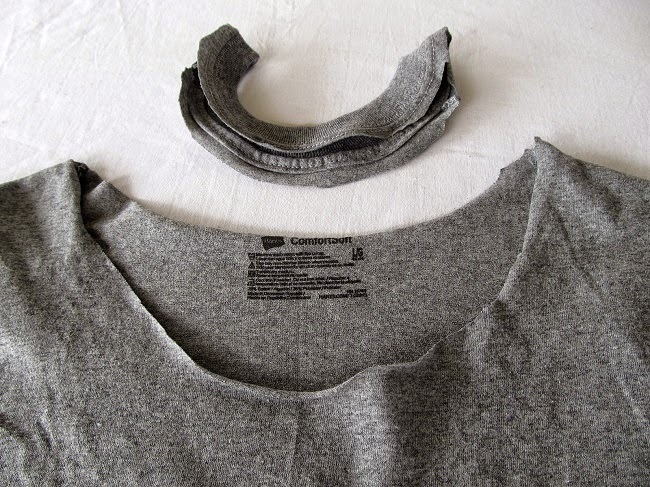 turn your shirt inside out again and trim the excess material around the heart. and trim any leftover thread. Now you are all finished. It's SO Adorable! I would love to see a pic of you wearing, though! Wow...I wish I had your creativity! Just may have to try and do this one!!! Thank you so much, you are too sweet!!! wowza! just found you via blue velvet chair. oh, my. ohhhhh, my. love this! Love this! Did you use a men's or women's large & if I may ask what is your build? for sizing purposes only! Love this... So making one!!! Oh, this looks really cute. Oi meu nome é Ana Paula, sou do Brasil e gosto muito desse cantinho. Vou fazer, colocar no meu blog, e colocar os créditos pra você. e não estava conseguindo, agora deu certo. EBAAAAAAAA!!! usted es tan dulce. Tener un día maravilloso. this looks so so adorable!! I just made one, but modified it a bit...I rolled the sleeves and tacked them up. I also added 2 straps that I stitched to the sleeves to hold them up. It is super cute!!!! Mine is a white shirt with a hot pink heart. I made one! Come on over to my blog I linked you up all over the place! I made this, but sewed the second fabric to the back of the shirt in a heart shape first. 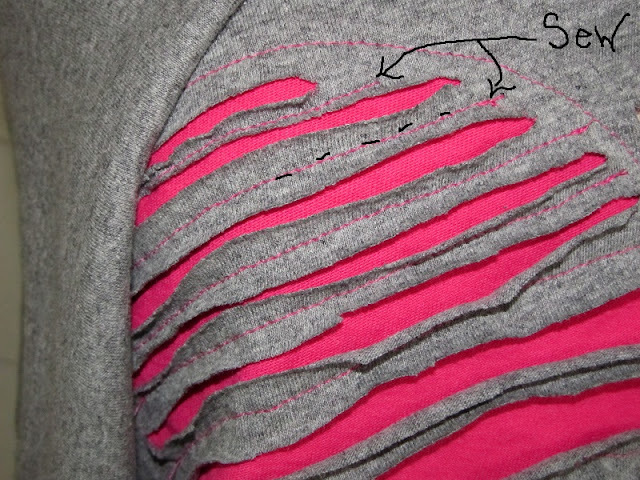 Then I stitched along the drawn lines on the front and then cut between the lines through the top layer of fabric only. Very easy. That does seem easy, thanks so much for sharing!! I am an addicted butterfly XD thanks! I just made the shirt, I used a piece of green frabic and made a shamrock for St. Patrick's day. Turned out great. Love it. I was thanking about doing that as well. :) so glad it turned out great. Hey there. The only problem with that is the heart will not keep it's shape .. Maybe a smaller heart would work. If you look at my skull tee on my pinterest page . That shirt is done the way you are thinking.. You can also type black skull tee in my search box. And the page should come up. Thanks so much for your question. 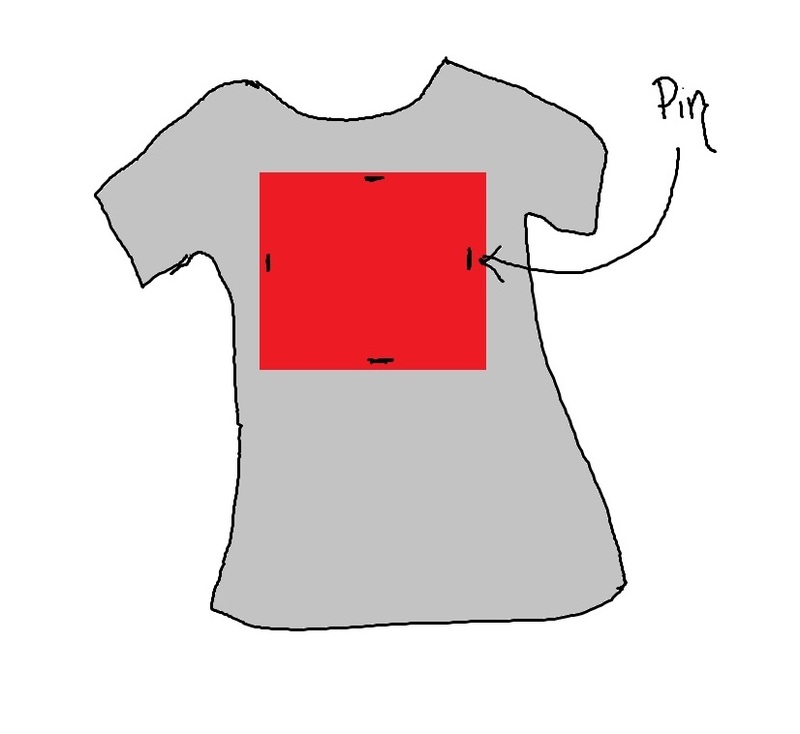 I loved the image of your shirt on Pinterest and made my own version without seeing your tute. Your colors are AWESOME! You're saying that heart will not keep its shape but if you make the appliqué with a non stretchy material probably it will help. For sure I will see with mine. Thank you for inspiration by the way! Thank you so very much. I would love to see when you are finished. Wow I simply love the top and want to try it so badly. The only problem is i dont know how to sew, at all. What if I cut the pieces for the heart and stick them through fabric glue? Would that keep it up? you might could use fusible web like wonder under.. you can get it at Joann fabrics, it is iron on to fuse fabric together. Just making sure....did you use a long sleeve tee or a regular sleeves one? It's kind of hard for me to tell in the pictures. Please respond!!!! What if I wanted to order one of these ? Would you make it and ship it if so email me connie-lea@hotmail.com. I so love this shirt and want one !!!! My sister told me to make it in February, it took me until now, but it's done. Your instructions were very precise. She loves the t-shirt. Thanks for sharing. I love this I am about to make it with my friends. Do you have any pictures of you wearing it? I just wanted to see how it fits. Thanks for the idea! Thank you! That helped alot. Could you substitute the sewing with fabric paint? [as in those bottles of fabric paint also known as '3rd fabric paint' or 'puff paint'? Absolutely, That is a fantastic Idea!!! Hi, I was wondering what exactly your measurements were? Just so I can see if I need a larger or smaller tee shirt to use. Thanks so much! Love this! I don't have a sewing machine and thinking of not sewing the colored material to the inside, but instead wearing a colored tank underneath. Or you can just wear a cami/tanktop under. I am 5'6".. would an XL work for me.?? Ok, I LOVE this shirt. I got everything I needed to make it. I started making but it was an utter disaster. I'm going to get another tee shirt and try again tomorrow. AWW I hope it works out today for you.. what was the most trouble? The sewing. The fabric under the heart loosened up so there was too much. If that makes sense. I think today I'm going to sew the fabric under first then cut the lines in the heart. I'm excited to try again. I'll share a photo on Facebook. Would this work with other shapes...like a ballet slipper?? My daughter would love to have a shirt like this for dance!! Thanks for this great tutorial! I have just finish to sew it for my daughter, refashionning a shirt from her brother. So cute ! Million of thanks for this tutorial ! PS: Several times I tried to comment here... hope this time is the good one ! Hey, do you think I could cut the design out and pull the strips, then just wear a bright cami underneath it? 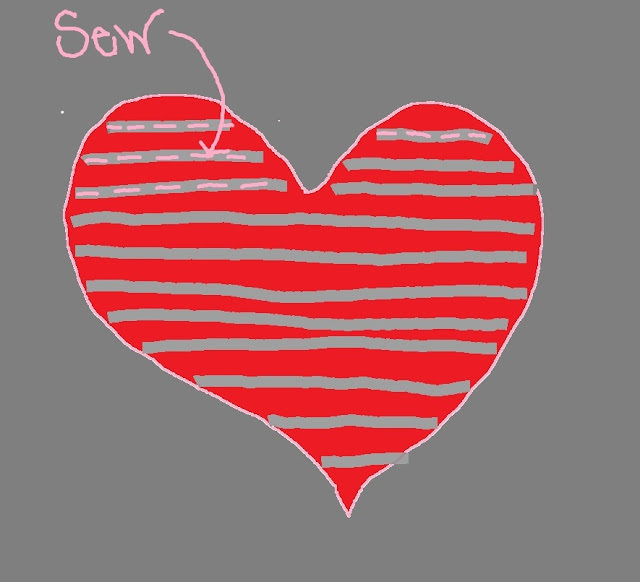 Do you think the design would still be clear, at least if I warped the heart shape so that it was taller? Would the tee have to be well fit for the design to show? Love you design....I got everything I needed to make it.Thanks. I wonder if you could make a ribcage tee using the same technique? I sadly don't have the material or skill to try this out myself. Thant is a great Idea for this fall! Something I will attempt just for you! What a charming idea - I love this DIY tutorial.